4TH AND BLEEKER: STARLIGHT, STAR BRIGHT! CLICK BELOW FOR MY LATEST HARPERS BAZAAR STYLE NETWORK POST WHERE I SHOW YOU MY IMPOSSIBLE WISH LIST OF THINGS I MIGHT SELL A KIDNEY FOR! 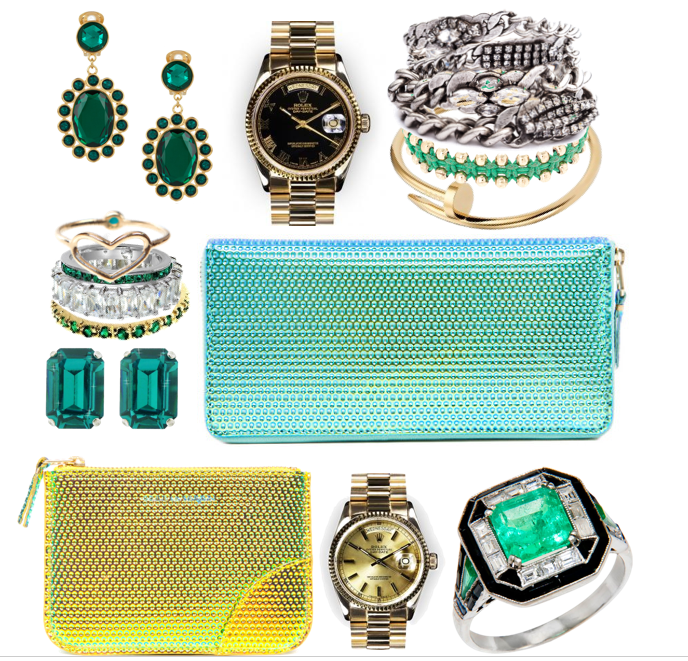 MIU MIU EARRINGS, ROLEX SIMILAR HERE, DANNIJO ID BRACELETS, CARTIER JUSTE UN CLOU SIMILAR HERE, JORDAN ASKILL RING, EMERALD ETERNITY BANDS SIMILAR HERE, COMME DES GARCON WALLET AND COIN PURSE, EMERALD CUT EARRINGS, ROLEX WATCH SIMILAR CARTIER ONE HERE, EMERALD RING. Gorgeous! Love all of it, esp those clutches! ooh i want them all! All of it is so beautiful! I love this tone of color specially in this season! Love Dannijo! So many lovely items. I'm sure on your salary you can afford them..unlike me! Amazing..I love these green shades! LOVE the Comme des Garcon stuff! Amazing! Love it all. Favourite is the DANNIJO bracelets. The best! I love all these things...the gold coin purse just...ahhh. ohhh just too good. love them all. yes; to all of it! Earrings, bracelet and coin purse! I love them! Wooow what beautiful jewellery and clutches!! I love especially the blue clutch, the first watch and these gorgeous bracelets!! Want them:) Very inspiring! If not, then use thhe street attack self defense moves above. They could be used against you. AuthenticWatches sells authentic luxury brand watches, with authentic watches listed with a BIG discount.